Demand response is seen as one of the resources with the greatest potential to support a large integration of renewables. 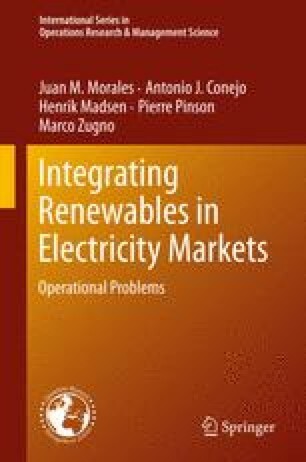 Indeed, consumer flexibility can help address the shortcomings of renewable sources with respect to conventional ones, namely, their intermittent and stochastic nature. Within this framework, real-time dynamic pricing is expected to incentivize small consumers to participate in demand response. This chapter models the involvement of small consumers in demand response programs with real-time prices. In the first part of the chapter, the stochastic optimization problem of small consumers exposed to dynamic pricing is studied. Formulations of the problem based on stochastic programming and robust optimization are presented, and put in the framework of model predictive control (MPC). Then, the issue of forecasting the aggregate response of flexible consumers to time-varying prices is addressed. Finally, the last part of the chapter deals with the determination of optimal dynamic price signals, aimed at making the most out of the consumer flexibility. These keywords were added by machine and not by the authors. This process is experimental and the keywords may be updated as the learning algorithm improves.